In a Nutshell: The average consumer has around 27 unique passwords they must remember to access important information like email, banking, brokerage, and credit card accounts. Many password vault programs exist on cloud technology that places control of your sensitive data in the hands of someone else’s technology. KeePass uses the highest level of encryption security to store an unlimited number of passwords either online or offline with the use of a master password or security file. The open-source software has many community-created plugins that allow hotkey access, database backup, and other convenient features for free. The proliferation of technology designed to make our lives easier comes with its share of potential problems — namely remembering all of the passwords that access our email, banking, and other important accounts. Most people would prefer to use the same easy-to-remember password for every website, but that’s like going to bed each night with your front door open and a spotlight shining on your unlocked safe. The average consumer has around 27 unique passwords he or she must remember. Each new login increases the need to safely store them somewhere for easy recall. Many modern password vault programs are stored in the cloud — meaning the security of your most private data depends on another company’s technology. Cloud storage, for all of its convenient features, is still in its infancy in terms of security. The best way to maximize the security of a password vault is to keep it locally held offline, something KeePass does with ease. KeePass is open source, free to download, and available on nearly any operating system, including unofficial mobile ports. The password database is encrypted and protected with either a password or a security file to keep sensitive details away from uninvited eyes. Users need to remember just one single master password to unlock the whole database. What sets KeePass apart from cloud-based password vaults is its ability to run locally offline in a location the user chooses. This can be a personal hard drive, USB flash drive, or on a subscription cloud service, if the user chooses. 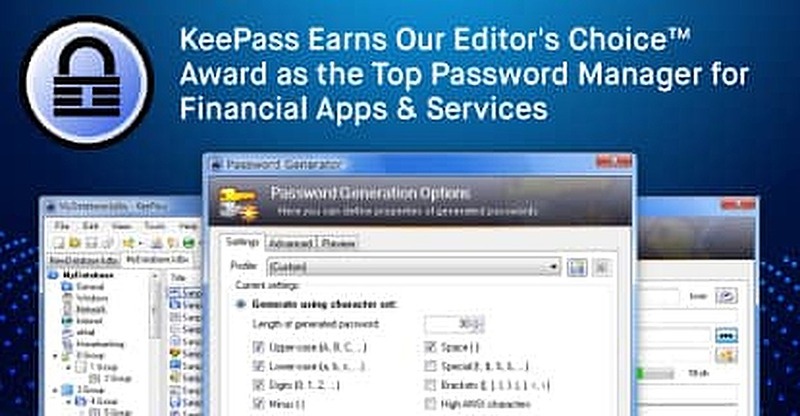 For its flexibility of use, and history of both security and dependability, KeePass has earned our Editor’s Choice™ Award for the top password manager for financial apps and services. KeePass’ databases are encrypted using AES-256 and Twofish, the best and most secure encryption algorithms currently known. The emphasis on security makes the vault among the safest choices for storing your passwords, either locally or offline, because the vault is useless without the master password required for entry. Even if your cloud account is compromised, your passwords remain safe (unless, of course, you use the same password for your vault and cloud access — which you obviously should not do). The program comes equipped with a password generator and synchronization function. KeePass also supports two-factor authentication and has a Secure Desktop mode. A two-channel auto-type obfuscation feature offers additional protection against keyloggers. KeePass uses the highest level of encryption security to maintain its password vault either online or offline. KeePass can import from over 30 of the most commonly used password managers and is capable of exporting to popular formats like TXT, HTML, XML, and CSV. An attractive feature of open-source software like KeePass is the wealth of community-contributed extensions and plugins available to users. The program’s plugin architecture makes it easy for developers to create and share new features, including currently popular plugins that support import/export from/to various other formats, database backup, integration, and automation. 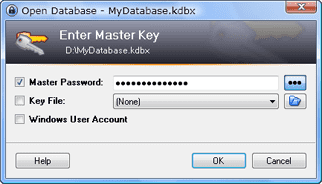 KeePass requires a master password to grant access to the password vault. When the KeePass database is open and running in the background, a global auto-type hotkey searches for the correct password in the database and auto-types it into the entry box, making the program easy and convenient for users who regularly use passwords. All fields — title, username, password, URL, and notes — can be dragged and dropped into other windows. Using the hotkey for auto-typing passwords makes accessing important financial accounts easier, as users are not required to toggle back and forth between KeePass and the financial website to cut and paste passwords. Having the option to maintain a password vault online or offline makes it highly portable. KeePass can be downloaded and run directly — for example on a USB flash drive or personal hard drive— to maintain access to passwords anywhere, regardless of internet access. The open source KeePass is supported by a community of users who regularly create plugins that improve the usefulness and convenience of the program. A popular plugin allows hotkey access that allows users to run an open version of KeePass in the background and have passwords automatically filled and executed in almost any type of form. Consumers have an ever-growing list of unique passwords to remember. That task is made nearly effortless when KeePass securely stores their passwords, and divides them into manageable groups, to maintain fast and secure access even without an internet connection.